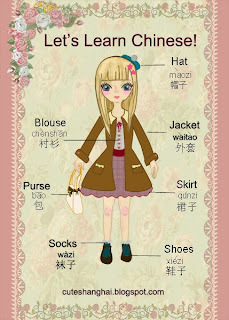 Cute Shanghai: Let's Learn Chinese Together! Today I am going to introduce some basic and general terms you might find useful when shopping for apparel. I'm not a Chinese language teacher, nor am I a native speaker, but I've found the words below to be handy when shopping both in store and online so I'd like to share them with you. Below is a graphic I quickly drew up to help illustrate the meanings. You can cover the words and test yourself to see if you know them all. Here are the words in a text format so you can highlight, copy and paste them wherever you need. Now that you know the basic articles of clothing, how about we try a few simple sentences. These sentences are what you'd learn in an elementary Chinese course. They are very basic, but if you know even this much, I've found you can easily get around in Shanghai and other parts of China. 1. Wǒ yào yí jiàn chènshān. 2. Wǒ xǐhuan zhè ge bāo. 3. Zhè dǐng māo tāi xiǎo le. 4. Ná ge wàitào hěn hǎo kàn. 1. I want one blouse. 2. I like that bag. 3. This hat is too small. 4. That jacket looks nice. You can substitute the underlined words for other verbs in sentence 1&2. In sentence 3&4, try using different adjectives such as their antonyms, dà and bù hǎo. The pink highlight here is used for measure words. 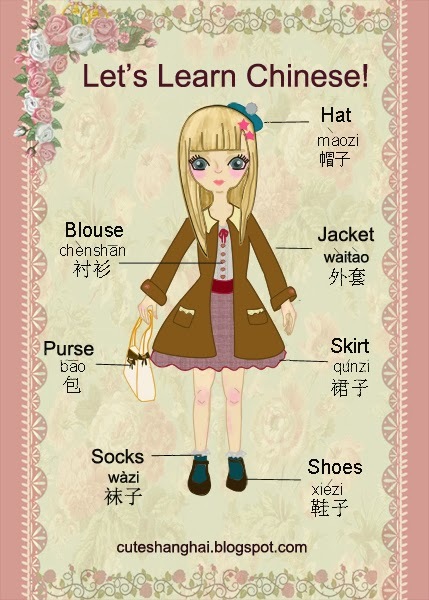 In Chinese you will find specific measure words correspond to specific items. *Tip* If you don't know the correct measure word, you can always fall back on the general one, "ge", but of course it's better to learn the appropriate matches. Finally we have the yellowish highlight which indicates the noun. Here we are using the basic clothing article we learned earlier. Thanks for learning Chinese with me! Below I've listed a few website that will help surely be of help when learning Chinese. Good luck in your studies!